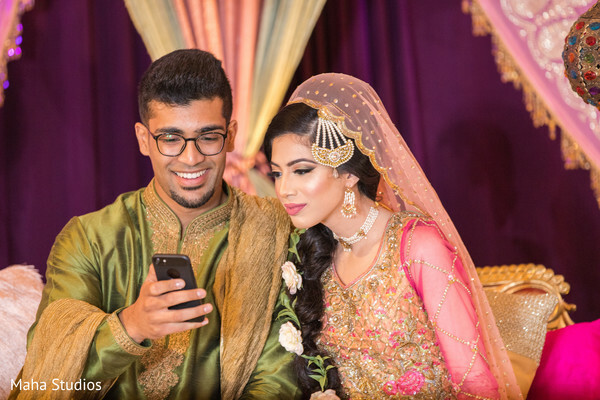 All posts with Style "Pakistani"
Maharanis! 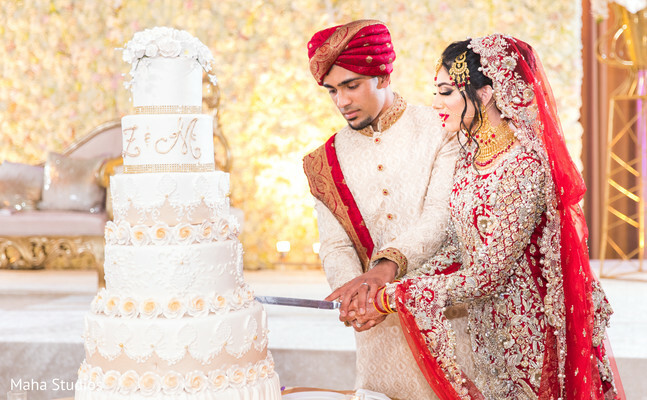 We continue celebrating Zoya and Maaz in the most beautiful way, showcasing all the greatness and beauty of their union. 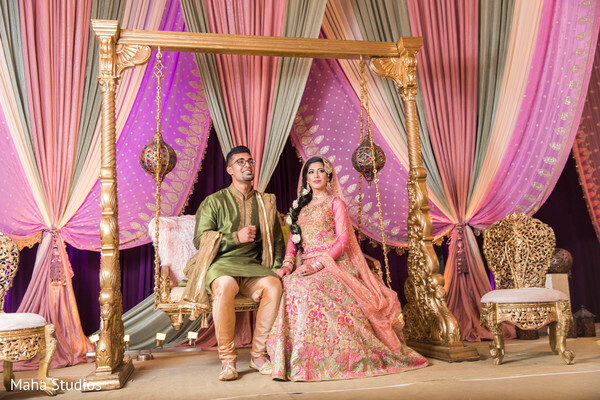 This darling duo held their reception gala at the Cotillion Banquet and before they started with their celebrations, Maha Studios organized and produced a timeless photo shoot to record their love and glamorous evening outfits! 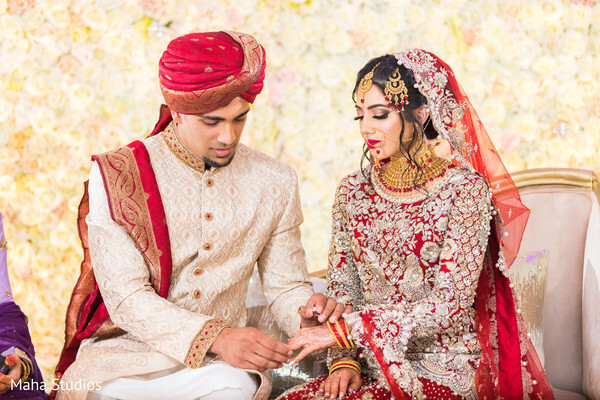 The bride was all dolled up with an astonishing sparkly attire and donned proudly her newlywed ring against an intricate mehndi design courtesy of Moniza Abbasi-Henna Artist; while her dashing groom Maaz glowed at his stellar evening thanks to a perfectly well-suited tuxedo! 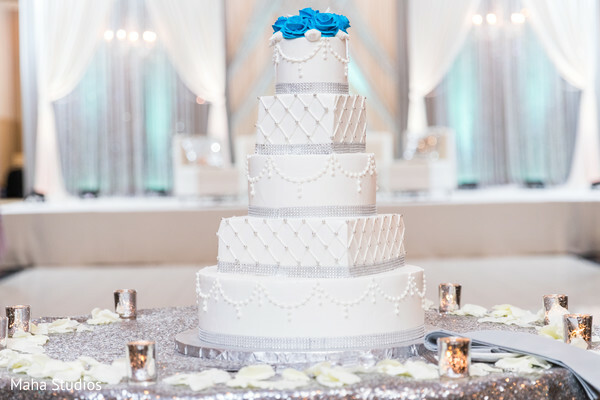 The ballroom was outfitted with white, silver and light turquoise colors that gave the dream decoration a light-hearted elegant touch! DJ Kazi ensured the dance floor always remained packed while Baking Institute wowed with an impressive sweet creation for the crowd's palate! 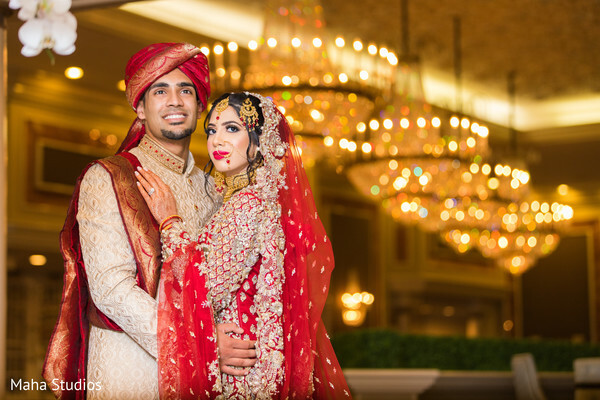 Anmol Catering also delighted all the attendees with an epic wedding dinner and service that surpassed all expectations. 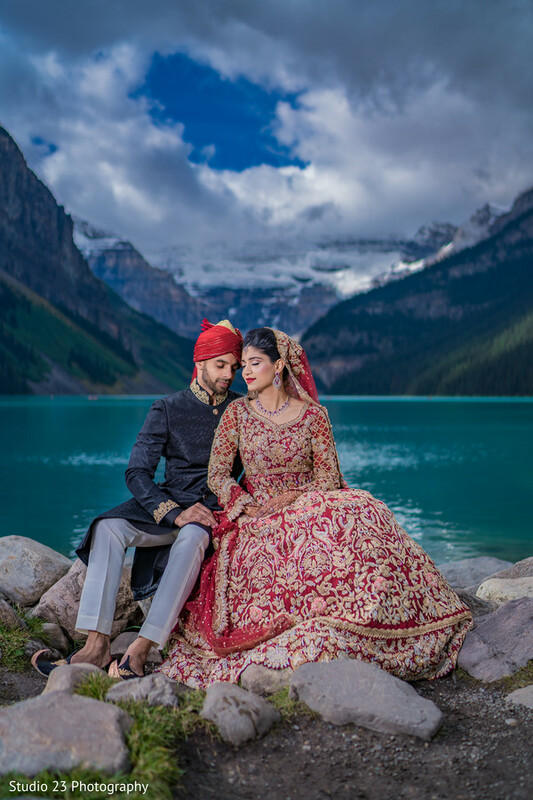 Check out this glamorous Pakistani bride and groom and their inspiring photos in Best of 2018 Magazine and in our full gallery! That’s all for today, ladies! See you tomorrow! 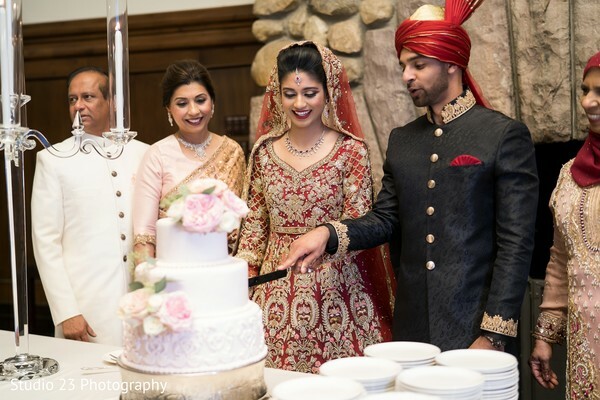 Anmol Catering is a member of the Platinum Guide. Love what you see? Explore their portfolios. 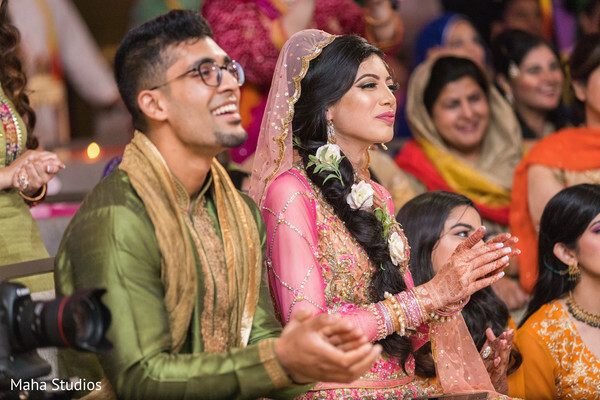 Welcome back loves, we continue with our extra special feature from our Best of 2018 Magazine showcasing the dreamy Pakistani nuptials of Zoya and Maaz! 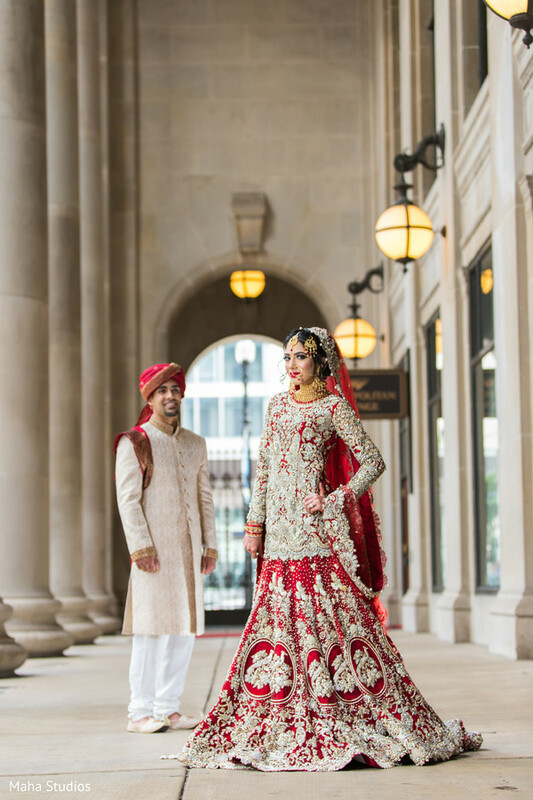 These two carried on with the wedding spree at the lavish facilities of the Drury Lane Theater and Conference Center. 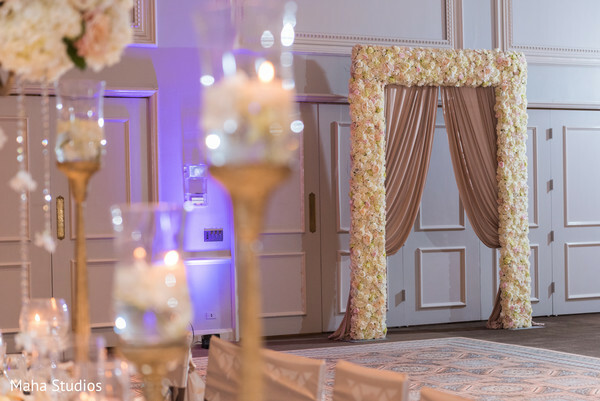 Amer Design Studio came back to deck the ceremony with a glamorous design for the official union that displayed tons of white blooms all over the ballroom, from a stunning floral arch that welcomed the guests, a spectacular flower wall to majestic centerpieces. 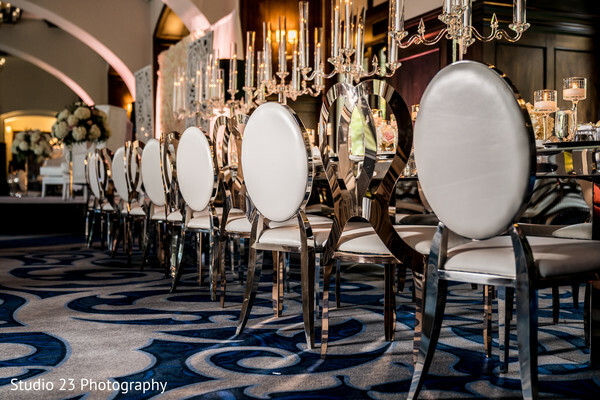 The opulence and grandeur were unparalleled! 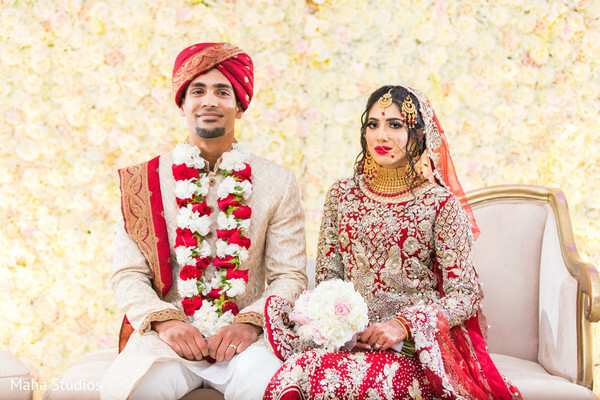 Our gorgeous bride, Zoya opted for a deep red bridal outfit which was all about detail and dazzle, her statement jewelry is truly breathtaking and she finally paired her heavily embroidered anarkali with a neat makeup created by Nadia Tikki! 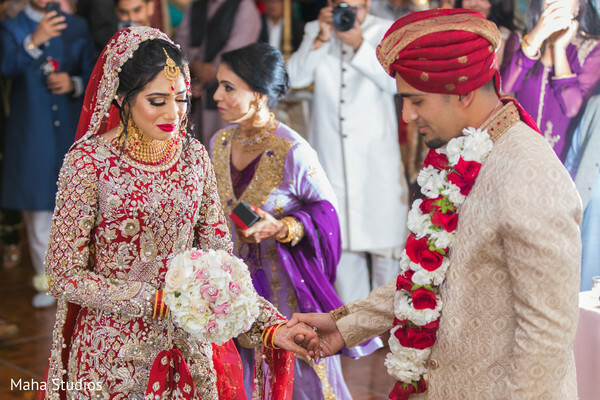 Maha Studios captured the auspicious occasion in a series of heartfelt and well-achieved photos that left us completely awestruck! We have our full gallery with all these amazing stills at your disposal for your viewing pleasure! 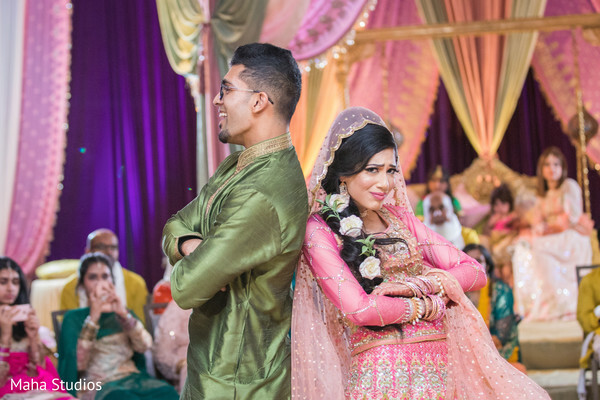 When we return we will be behind closed doors of the marvelous bash of Zoya and Maaz! 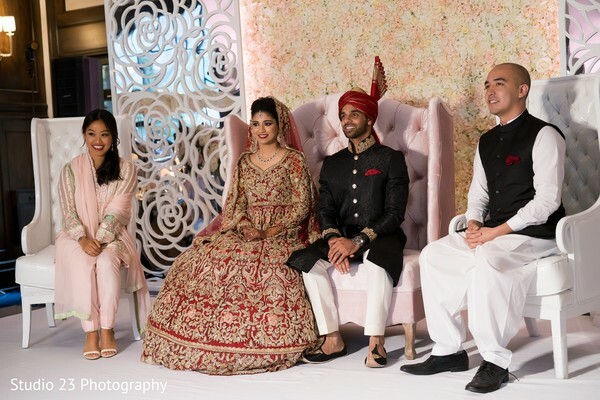 Straight out from the pages of our "Best of 2018 Magazine", Zoya and Maaz's Pakistani affair is undoubtedly one for the books! 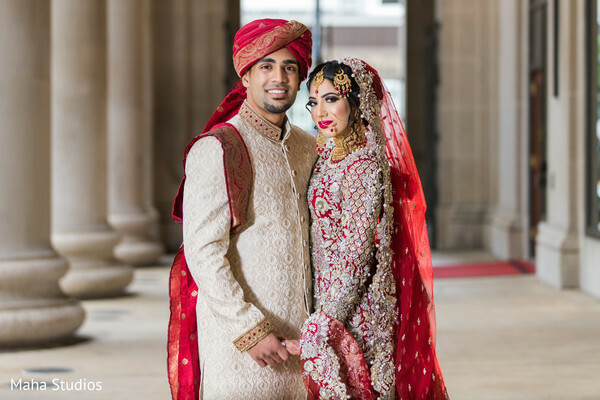 Maha Studios unfolds this perfect Muslim wedding and shared with us all the stunning imagery! 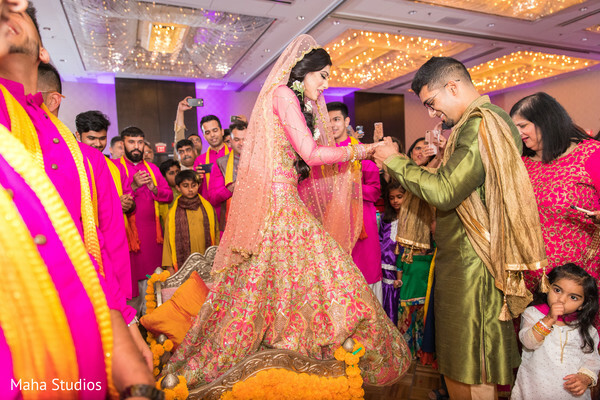 Their beautiful wedding journey kicked off at the elegant DoubleTree Hilton Oakbrook with a rocking Sangeet night that was a colorful feast for the eyes! 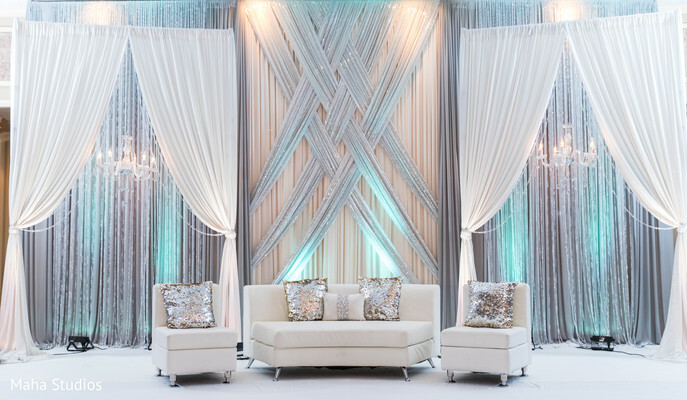 Chicago's premiere decor studios Amer Design Studio was responsible for the heavenly decor that included a vibrant sweetheart stage perfectly draped with shiny pastel color fabrics and lovely Moroccan lamps! 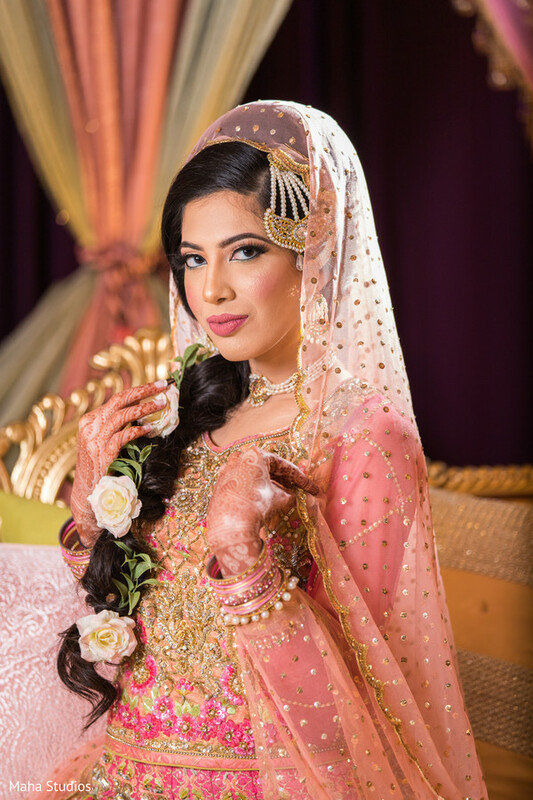 Maharani Zoya channel her inner diva with an elegant pink outfit that she completed with a graceful floral side braid by Mehwish Khalid! 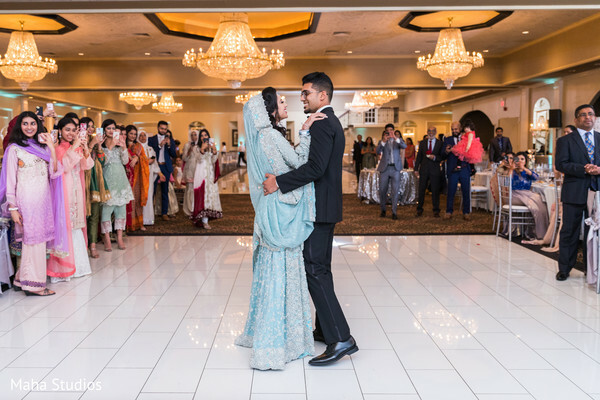 The functions were full of music and fun and soon after the liveliness of this pre-wedding ceremony was over, Zoya and Maaz prepared for their stellar moment! 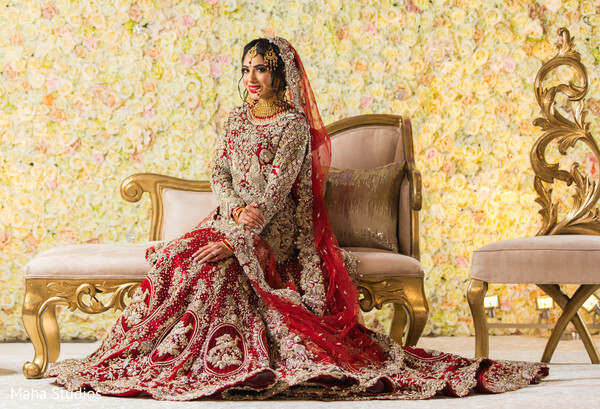 Discover the complete gallery and take a sneak peek of this amazing Pakistani marriage. Ladies! 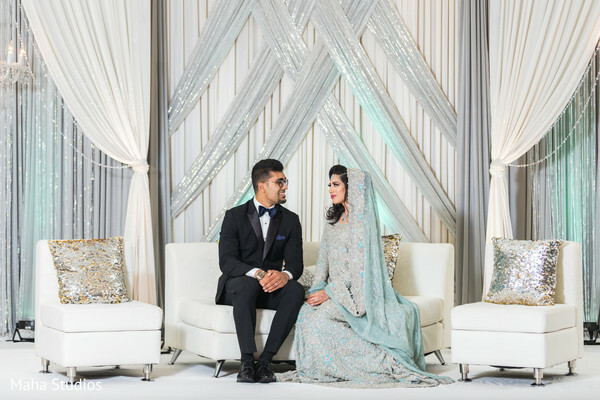 Join me in for the Nikkah ceremony coming up next. Welcome back, dolls! 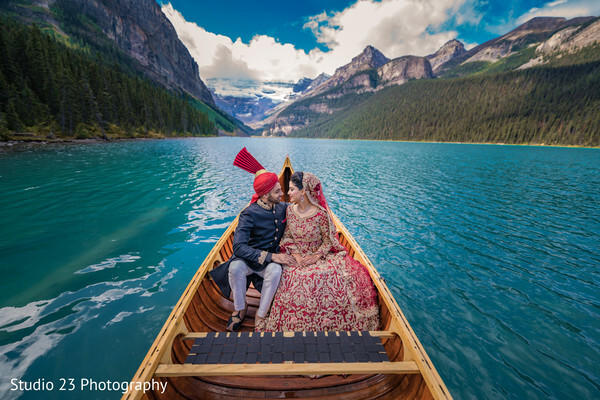 For this marvelous photo shoot, Lubna and Waqas looked adorable wearing their traditional outfits against this staggering scenario and felt a little more adventurous by jumping into a canoe to strike the pose for the cameras of Studio 23 Photography! 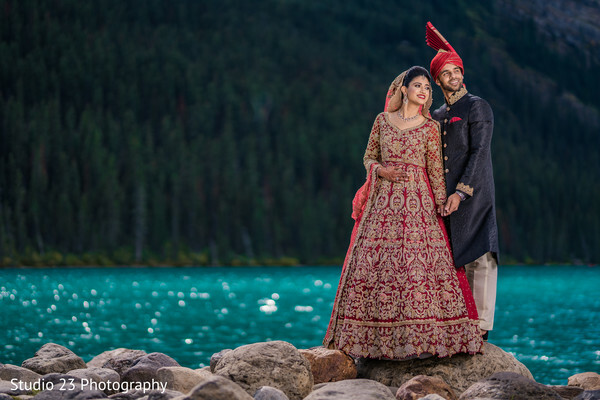 What a unique photo session! Maharani Lubna bedazzled in an intricately embroidered red outfit while Ms Painted Lady took care of all her beauty needs, giving her a queen flair! 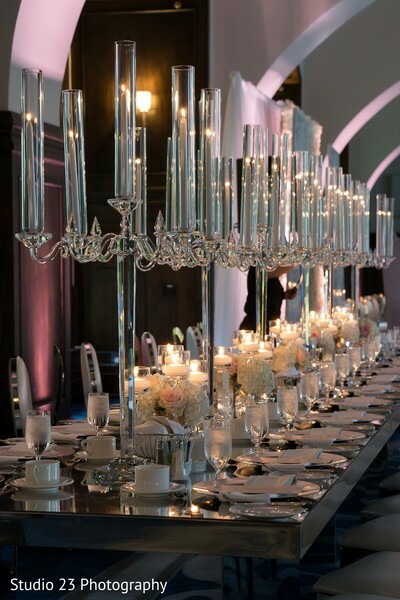 Lynn Fletcher Weddings planned and designed this fairy-tale wedding reception for the ages! 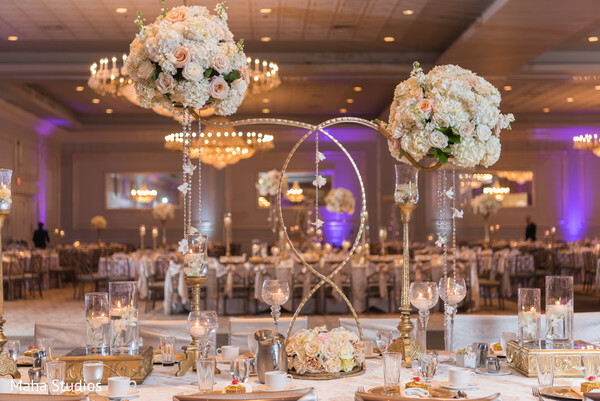 Providing an incredibly amazing setup of stunning florals and chandeliers plus a divine wedding stage décor adding this way a big splash of elegance to the scenery! 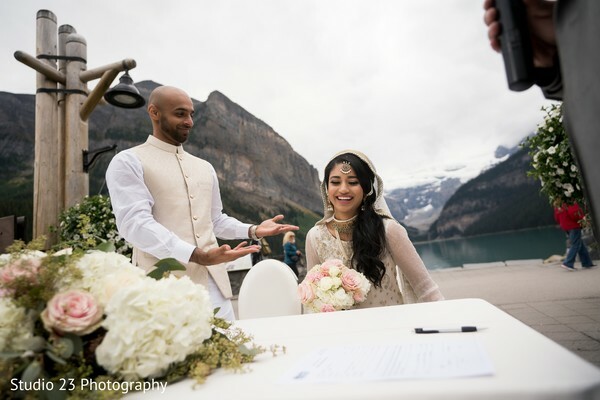 DJ Jas Roadshow played the best songs that enlivened every festive dance performance while Fairmont Chateau Lake Louise provided a lavish meal that made every guest happier! 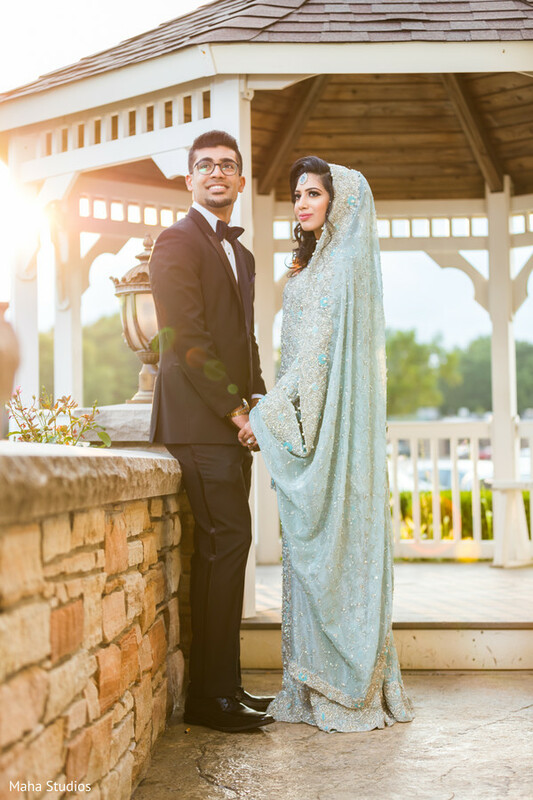 I’m totally inspired by all the beauty that this soiree contained and I can’t wait for you to see it in our full gallery! Take a tour through the imagery! 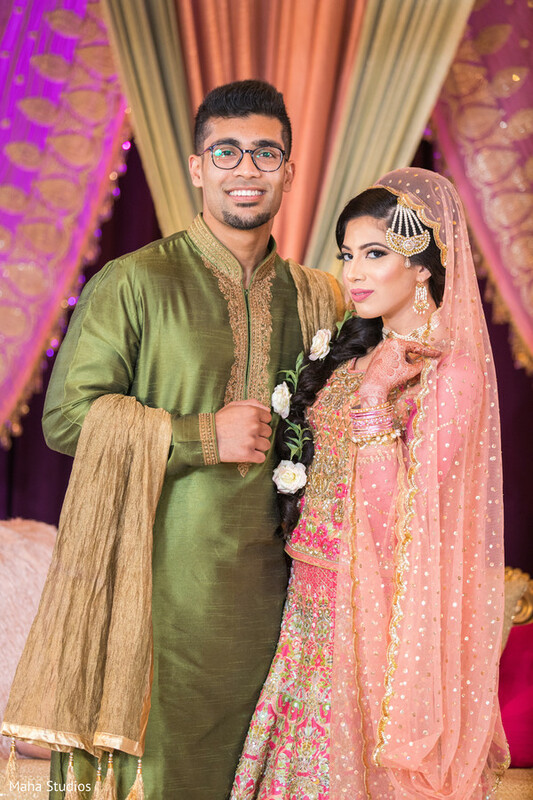 We met through mutual friends on Christmas Eve a few years back. Waqas had a scavenger hunt planned. I woke up to a couple of cards outside my bedroom door which was how it began. He had a day of activities planned for me. The final clue was a car was picking me up at 4:30 from my house. 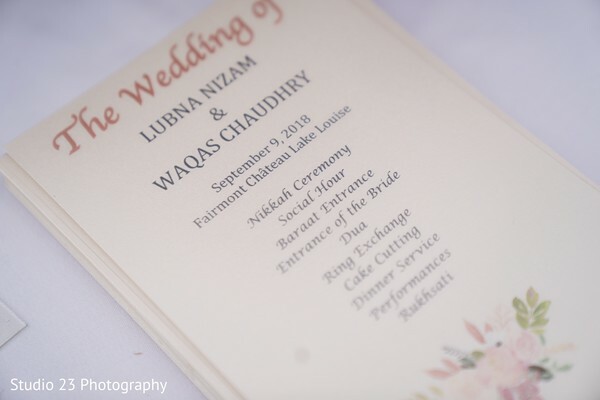 My driver arrived and took me to White Rock Lake, which is where Waqas proposed. 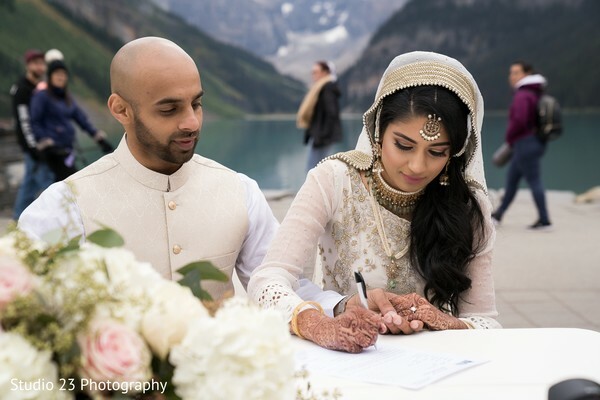 From the very beginning, I knew I wanted a destination wedding. 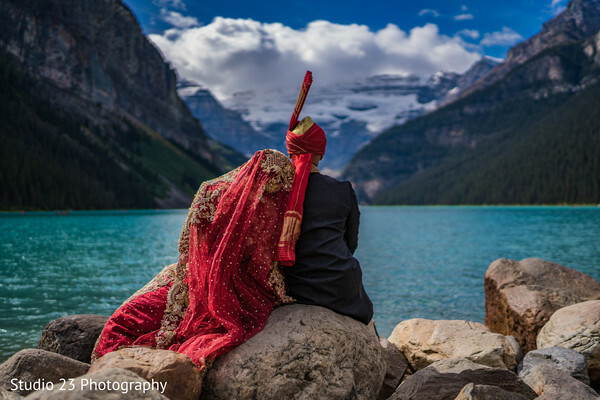 Picking Lake Louise for our wedding was an easy choice after visiting the destination a few times. 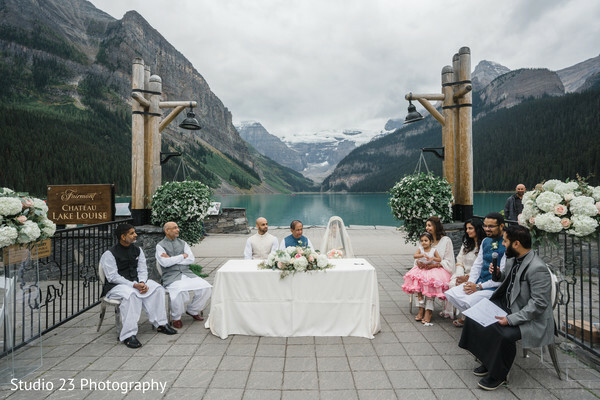 Before visiting, I knew I wanted my ceremony to take place on the Terrace at Fairmont Chateau Lake Louise. After our visit, it didn't take much convincing to seal the deal. 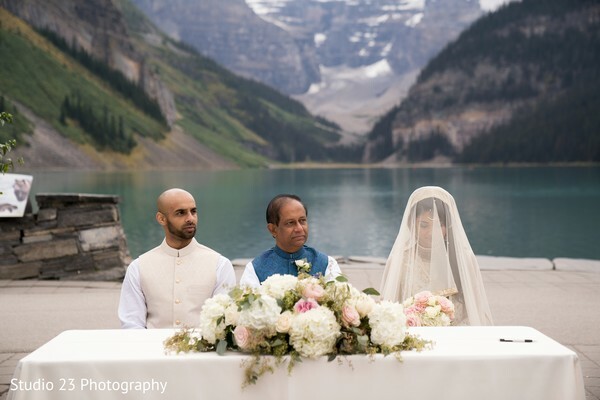 When I went to Banff, we viewed several properties to decide where we would have a Welcome Party and Valima. 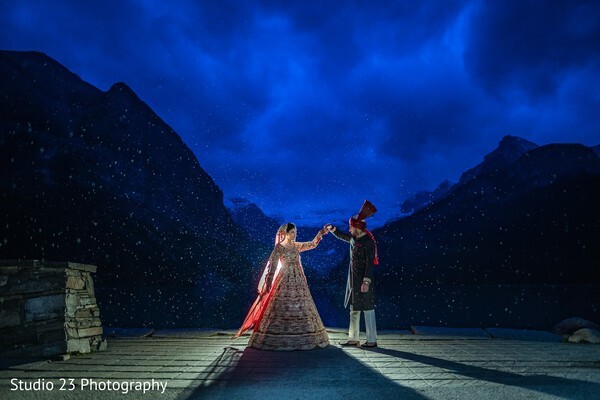 We chose Canmore Opera House for our Welcome Party since it is a quaint and cozy venue with a beautiful backdrop. 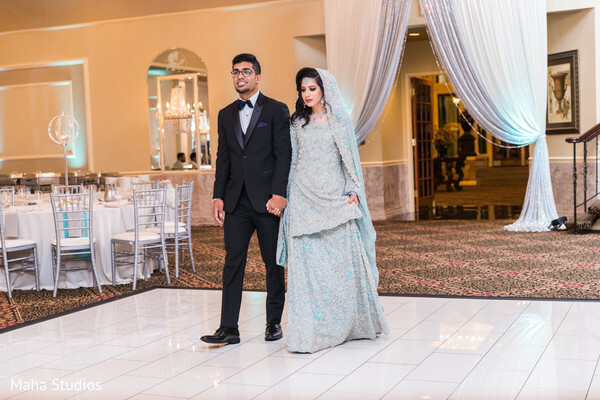 When we visited Sky Bistro, I knew it was perfect for the Valima. It is on top of the mountain so all of our guests had to get on a Gondola to get to the top of the restaurant. 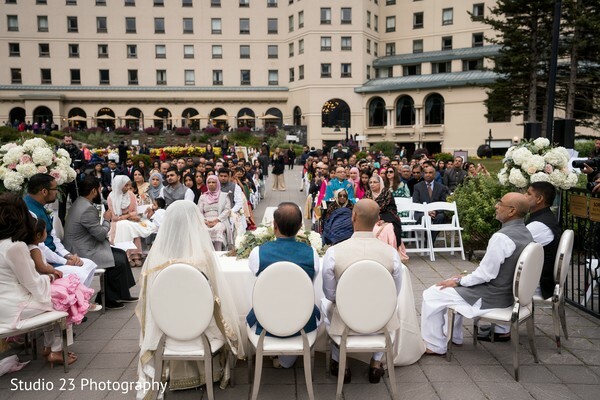 We were so happy with all of our venue choices, the views exceeded our expectations. Hair and Makeup was very important to me, so we flew in the very best, MsPaintedLady from Dallas. The location and that they were able to make a vacation out of it. 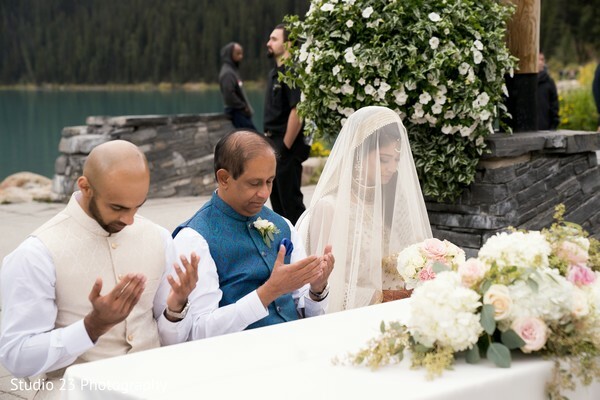 When I first told people I was having a destination wedding, most people first question was "how are your parents okay with it?" It wasn't hard to convince them at all. 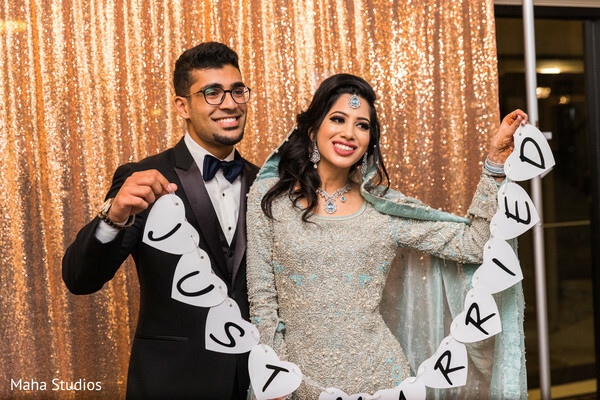 After hosting my sisters 5-day wedding in Dallas for 600 people, my parents were completely on board for a change. We had a live painter at our ceremony and reception. It was such a special touch. We have the painting hanging in our home now. We wanted to make sure all the concerns of our guests were taken care of. 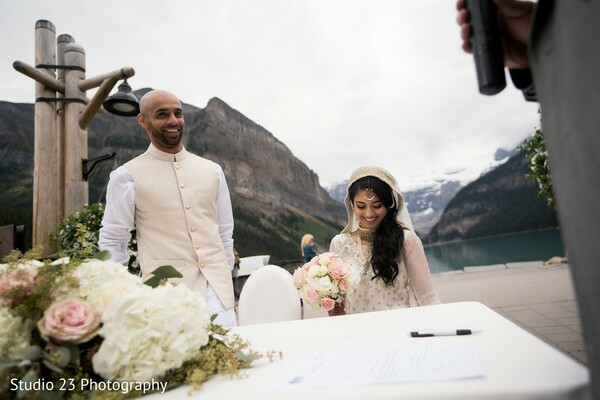 It was important to give all guests a welcome bag with some essentials, we had sunglasses during our ceremony, we had shawls and hand warmers during our ceremony in case it got cold. 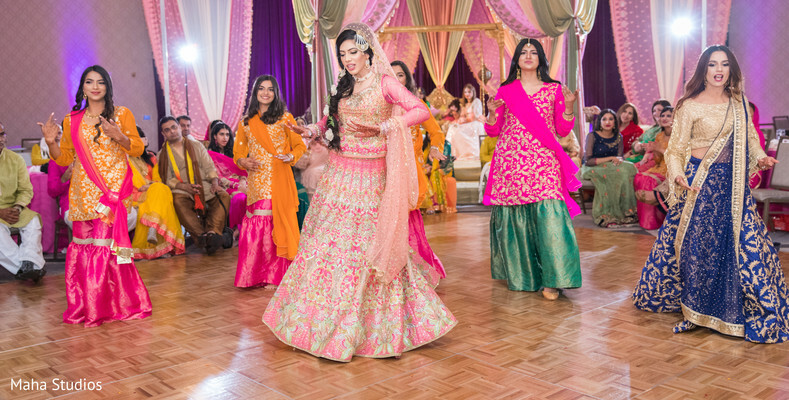 Several of my cousins put together surprise dances for us. 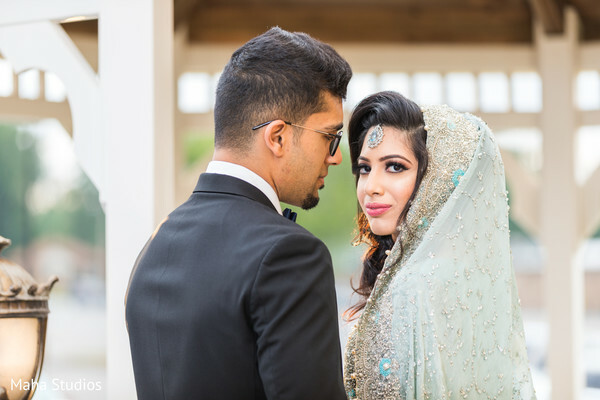 I hope you loved this Pakistani dream wedding! We are still in paradise, loves! 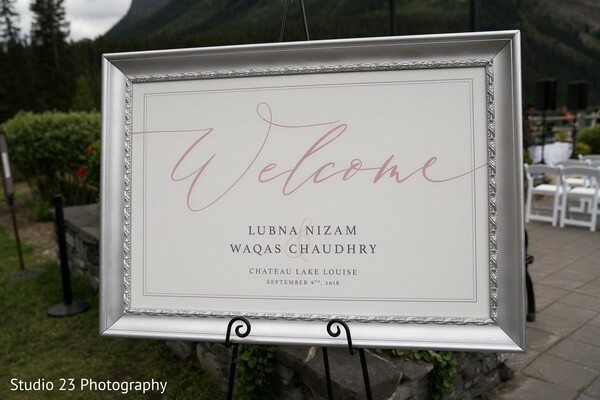 Lubna and Waqas were ready to say "Yes" at the stunning Victoria Terrace of the Fairmont Chateau Lake Louise overlooking the Lake Louise and its impressive surroundings that allowed some extraordinary well achieved photos from Studio 23 Photography! 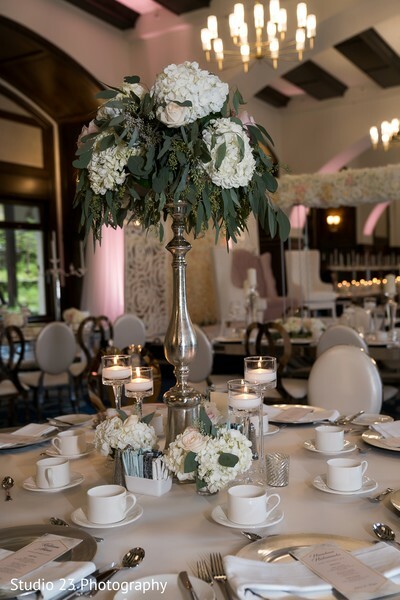 The understated elegance, such a romantic color palette of peaceful shades of beige, ivory, white and light pinks created by Lynn Fletcher Weddings gave an air of absolute elegance and delicacy to the decorative and floral elements! 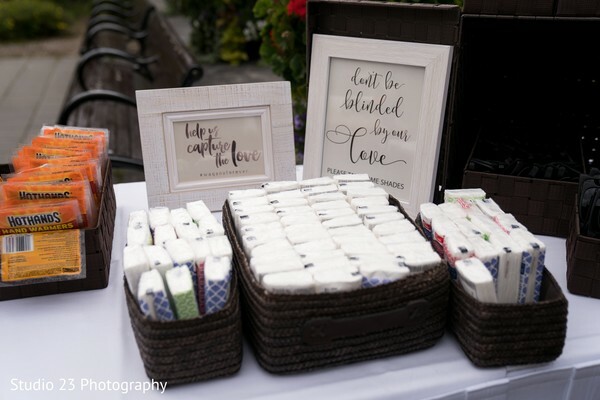 These two wanted to warm up their guests with charming blankets and cozy favors that spruced up this outdoor ceremony. 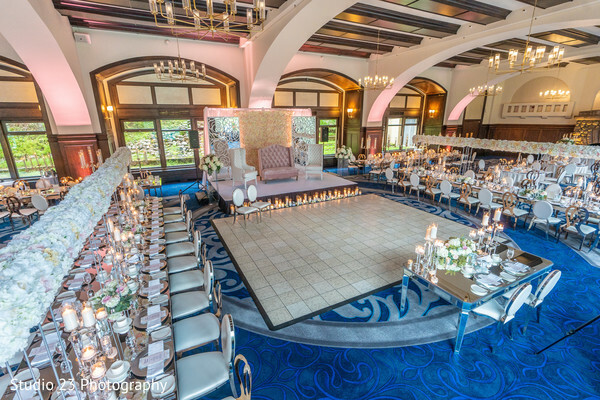 Lynn Fletcher Weddings were also in charge of ensuring that their event would come off as desired and what a marvelous job they did as the ceremony was a beautiful event! 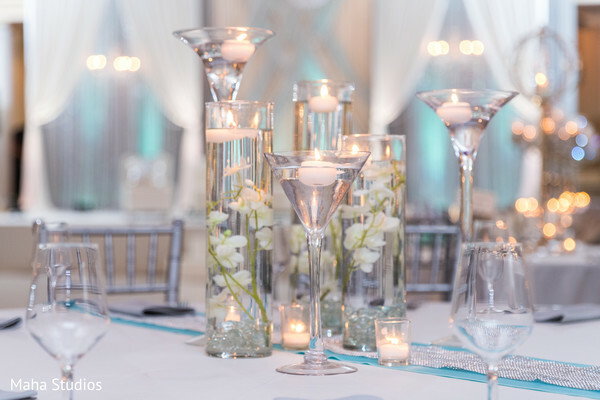 See all the inspiring layouts in the images below and visit our complete gallery! See you in a bit for the reception!